At the end of 2014, the modernized Pawn emerged with contemporary modern decor and a whole new menu under the direction of British multi-Michelin-starred chef Tom Aikens. Chef Aikens previously trained at Michelin-starred restaurants Tante Claire (3 stars) and Pied à Terre (2 stars). 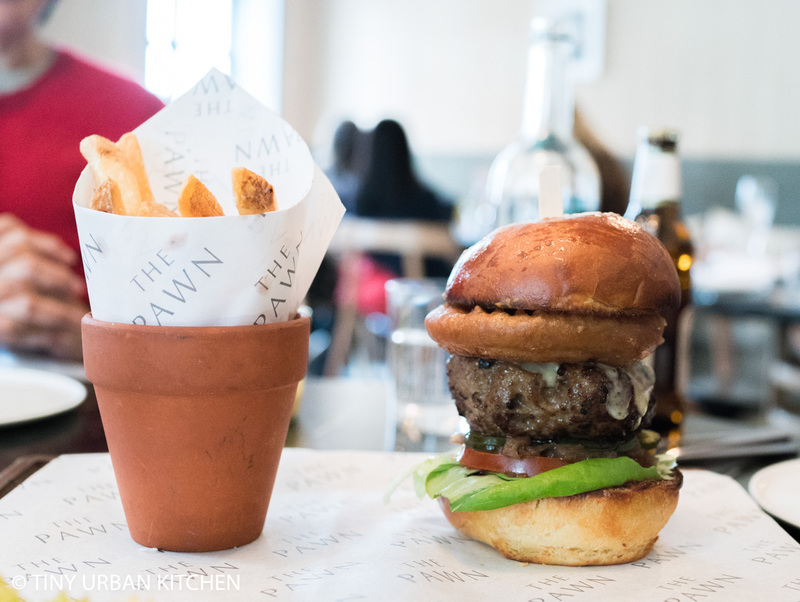 His dream for the newly revamped The Pawn was to offer a mix of French-inspired elevated food and a more refined version of British classics. In Chef Aikens’ words, a “balance between high-end and also good honest British cooking”. The Pawn aims to offer a mix of traditional and modern cuisine. The first floor is a ‘Botanicals’ bar which offers really edgy and creative atisanal hand-crafted cocktails. The first floor also offers small bar bites and a simple brunch and lunch menu. The second floor is the ‘Kitchen’, which offers a larger menu suitable for brunch, lunch, or dinner. There’s a lovely open kitchen and even a balcony of coveted tables overlooking Johnston Street (we weren’t able to get them the day we went). The brunch is famous at The Pawn, and rightly so. The food is excellent, and it’s a decent considering that free flowing drinks are included and kids up to age 12 eat free (one paying adult per free kid). The non-alcohol free-flowing brunch (which still includes some pretty fancy fruit juices) is 498 HKD per person. Add 100 HKD (598 HKD total) to add free-flowing alcohol (Moet et Chandon rosé imperial, bloody Mary, house red and white wines). All of us (except for Bryan’s mom, who doesn’t drink), opted for the free-flowing alcohol version since we figured even if we just drank one or two glasses of something it would be worth it. Plus, it’s lovely to start brunch with a glass of sparkling rosé. We began with Starter to Share, which included both the Brunch Board and the French Toast. The Brunch Board consisted of fresh ricotta, crushed avocado toast, spinach salad, crab dip, and grilled vegetables (red bell peppers and portabella mushrooms). Ingredients were fresh, flavors were spot on, and overall it was quite good. We really enjoyed the French Toast, which came with a vanilla blackberry marscapone and a blackberry caramel sauce. After finishing the starters, we moved onto the main course. The menu includes several options. Since we had a party of four, we were able to try four different ones and share them all. Of course, you can also just individually choose your own favorite main course. The Sweet Corn Pancakes were fantastic, filled with pieces of real corn and served with a side of corn flavored “syrup” and grilled avocado pieces. Chef Tom Aiken’s fish and chips, The Pollock,are famous, so we knew we had to try it. The deep fried pollock had a lovely, crispy exterior and came served with wedge-like “fries”. The server claimed he thought The Pawn had the best burger in Hong Kong, and I can see why. The Beef Burger, which comes with shallot butter, a huge onion ring, dill pickles, lettuce, and tomato, was fantastic and certainly has standing to be one of the best burgers in Hong Kong. The Fish Pie was classic British and it was good. Cod, haddock, and mussels were cooked with leek, cider, and a parsley crust. The seafood was topped with a layer of whipped mashed potatoes. We ended with some simple mignardises (sweet bites) as well as espresso for anyone who wanted it. It was a lovely, relaxing place to spend a weekend morning. Food was excellent, the ambiance was lovely, and we didn’t feel rushed at all. The restaurant even set aside a playroom for kids, allowing parents to relax a bit more at the dining area. I would love to come back and reserve one of the outdoor tables overlooking Johnston Street so I can get the full experience of enjoying a nice glass of Moet et Chandon rosé imperial while watching the traditional Hong Kong”ding ding” tram go by. Finally! A place in HK that I have been to!